My hubby was born in New York, so this print was well received by him! paired with some bright sheets, I love the look in our master bedroom. The comforter is super thick and high quality. We have dogs, and had to wash the comforter almost a few days after we had it - it washed up well. I would recommend this set. The comforter is super thick, and has a little weight to it. If you are a hot sleeper - this will be WAY to warm for you most likely. I love it though! Introduce a unique and strikingly bold addition to your bedroom decor with the Urban Habitat Hudson 7-Piece Cotton Comforter Set. 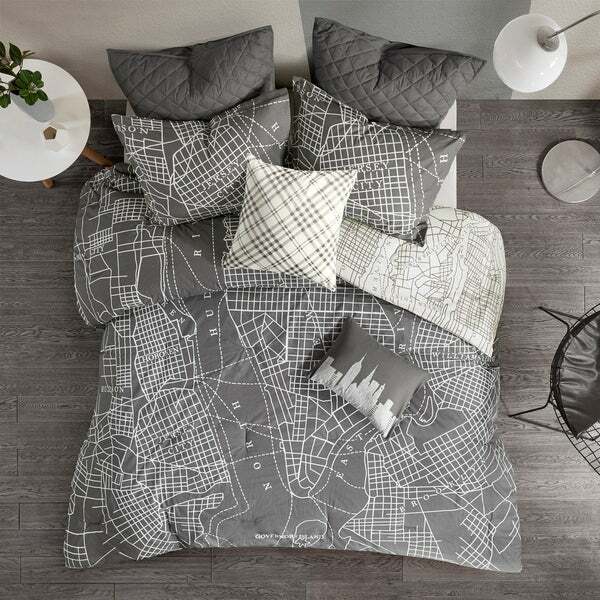 The reversible comforter and shams display a map of Manhattan, Queens, Brooklyn, and Hudson in off-white lines on a charcoal base fabric, for a modern look. The reverse flips the color scheme allowing you to pick the perfect side to fit your bedroom, while two quilted Euro shams add a dimension to the cotton bedding set. Two decorative pillows with complementary designs provide the perfect finishing touches. Set includes comforter, 2 matching shams, 2 euro shams and 2 decorative pillows. Made from 100-percent cotton, this reversible comforter set is machine washable to make cleaning simple and easy.